Setting the clocks ahead today got me thinking – again – about time. How controlled we are by it! Funny thing is, time doesn’t really exist. It is a totally human invention, yet we treat it as if it were a real entity. It is always now. There is no “past” or “future” except in our minds and memories. Time is not linear. Time travel is not possible because there is nowhere – or rather no when – to physically go “back” to. It’s all right here and now. (I just realized the word “nowhere” can be broken down into “now here” – how ironic!) They say dogs can’t tell if you’re gone for an hour or ten. Sure, they may get hungry or need to go out, but they don’t mark the passing of minutes and hours like we do. They just experience life in the here and now without thinking about yesterday’s argument or tomorrow’s bills. So is it thinking that creates the illusion of time passing? Is it all in our minds, a way of organizing all the many “now” moments in our brains? Imagine what life would be like with no clocks or calendars. Would we be better able to live in the present moment? 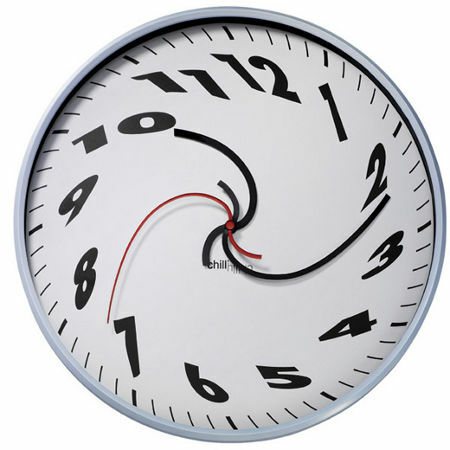 Try living without your clock for a day (make sure it’s a day when you don’t have any pesky, time-based appointments!) We’ve all experienced days or parts of days where we were so engrossed in what we were doing that we had no awareness of the passing of “time.” It just “flew by.” We paid no mind to it. If you’ve ever been in a casino where there are no clocks and you can’t tell if it’s day or night, you know what it’s like to live “off the grid” as far as time is concerned. Just enjoying the moment with no deadlines or schedules. In the case of time, ignorance truly is bliss.